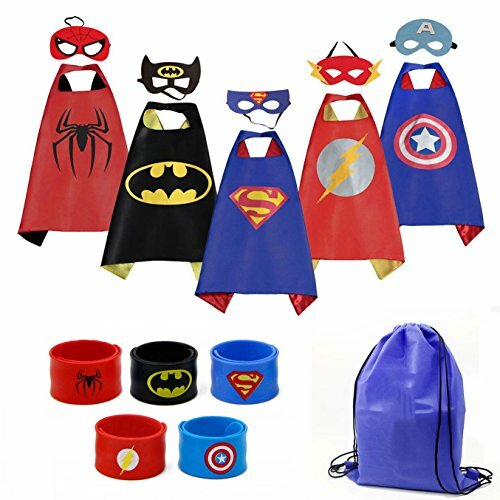 The Capes Size is roughly 27"×27", Masks measure approximately 6 1/2" wide and 3" to 4 1/2" tall (depending on style), Suitable for children 3-10 years old. The perfect present for your children! Great for Party favors and Birthday Presents. The cape is silky to the touch, feels great on the skin with vibrant colors that will not fade. The mask is made of premium felt. This capes set suitable for chilren have fun hours of create their imagination being his/her favorite character. For the best look possible, all capes should be ironed on VERY LOW heat before use. Capes should be hand washed in cold water and air dried. Masks should be wiped clean with a damp towel. If you have any questions about this product by Mizzuco, contact us by completing and submitting the form below. If you are looking for a specif part number, please include it with your message.